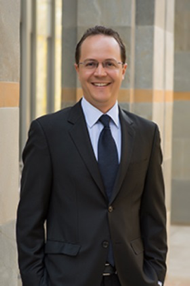 Eduardo Cetlin is head of global philanthropy for Amgen, the world’s largest independent biotechnology firm serving patients with serious illnesses. In this capacity, Eduardo leads two separate corporate foundations to inspire the next generation of scientists, provide life-saving medicines for patients in need, and support local communities. Under Eduardo’s leadership, the Amgen Foundation creates excellent learning opportunities for high school and undergraduate students. By actively partnering with science teachers and combining proven hands-on science experiences with the best online education platforms, the Foundation is delivering a world-class biology education to students around the world. Since 1990, its hands-on programs for teachers and schools have reached more than 600,000 students. Eduardo has forged partnerships with the best universities and online education platforms used by more than 50 million people. See www.amgeninspires.com to learn more about the Amgen Foundation. Eduardo is active on The Conference Board, acting as Vice-Chair for the CSR Committee, and Chair of its Program Committee. He joined Amgen in 2003 after an early career in finance management at General Electric (GE). He holds a B.S. in Business Administration from Universidade Federal de Minas Gerais, Brazil, and an MBA from the UCLA Anderson School of Management. Eduardo lives in Simi Valley California, with his wife and two young daughters, and strives to keep Portuguese as the official language of the Cetlin residence.